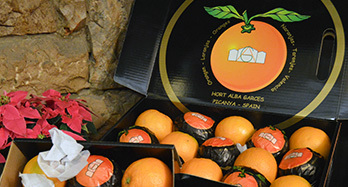 Enjoy our gourmet box of 45 oranges, inside you will find three boxes ready to give away with fifteen oranges each. Make a healthy and different gift that everyone will love. For individuals, who want to have a detail with family and friends, and for companies that order large quantities, we take care of transport to different points in Europe, and we offer you the option to personalize the gift.